SHOULD YOU BREAK YOUR MORTGAGE OR PORT IT WHEN SELLING AND BUYING A NEW HOME? Whether you can port a mortgage depends on a few factors but ultimately it all has to do with numbers. Porting a mortgage may not be in your best interest especially if you’re not happy with your current lender and want to search out a new one. The good news is that if you can save money and you’re eligible to port your mortgage you’re doing alright. Renewing a mortgage is far different from porting a mortgage which I’ll get into a later but in the mean time wrap your head around this question- How much do I know about my current mortgage? If you haven’t read the fine print now is a smart time to break out the paperwork. 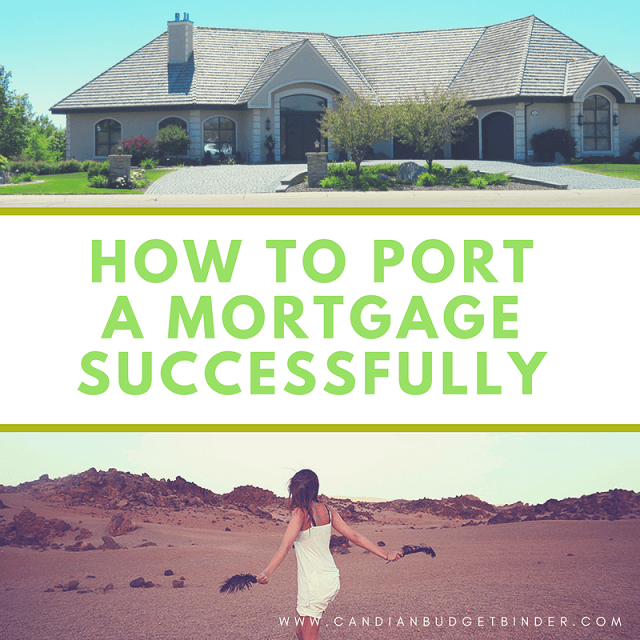 Why am I talking about how to port a mortgage today? Honestly, I had no idea about how to port a mortgage in Canada but I do know that it’s a common practice in the UK where I was born. What I’ve learned while living in Canada as a permanent resident is that I can’t compare apples to apples from what I know in the UK to my new life in Canada. Since we’ve only lived in our current home for 9 years I wasn’t even thinking about porting a mortgage but the topic was brought to my attention. With the big boom in buying and selling over the past 6 months in our area we’ve seen an exponential incline of buying and selling. Most families that have sold were moving out of the city to profit from their sale to move into a comparable home but at a cheaper price. Others were building or securing something a bit larger for their growing family. Although the housing market is cooling down with price adjustments slowly creeping in homeowners are still determined to buy and sell hoping to cash in or cash out. Can I transfer my mortgage to another house? For the past 2 weeks I’ve helped friends of ours with work in their home as they are renovating and painting top to bottom. The reason they are cleaning up the house and adding some curb appeal is because they plan to sell so they can buy a smaller house but with a bigger property out-of-town. While lugging out a huge dresser into their storage container on the driveway he leaned over and asked me if I knew anything about porting a mortgage. He knows I’m a bit of a finance nerd and I’m always peeking into the real estate market to keep up with trends. What I wasn’t familiar with was how to port a mortgage in Canada successfully and whether it was even possible. I told him that I knew what porting a mortgage was as it’s not new to me but I wasn’t sure how it worked in Ontario. There’s nothing worse than finding out that you should have done something differently especially when it comes to purchasing one of the biggest investments you may ever have. What does it mean to port a mortgage? Porting a mortgage is simply transferring the mortgage amount and interest rate from your old home to your new home and securing the extra borrowing at the same rate. If you are 3 years into a 5-year fixed mortgage and want to continue with the same rate you might be successful in taking it along with you. Why would you want a portable mortgage? To save money and keep your current interest rate which may be lower than that of the current rate. Pretty simple concept…it’s all about the money especially with a home purchase a huge investment for anyone. Are you eligible to port a mortgage? Ah, here’s where things can get tricky. If you’re not sure if you mortgage is portable the best thing to do is make an appointment with your lender and go over your mortgage documents to find out. While you are there you can also talk about whether it’s the best option for you given current interest rates. Doing a mortgage rate comparison is essential especially when you don’t want to pay a penalty for breaking your mortgage. This is a time where you want to come prepared with questions about porting a mortgage when looking for advice from your lender. Keep in mind they are in the business to make money so ultimately the math falls into your lap. One of the misconceptions about porting a mortgage is that you don’t automatically get to do so. It’s up to your lender to review your financial situation and whether you’ve been a good lender or not. They will also want to confirm that you are still working and who your current employer is. You’ll basically go through the same scenario when you first went for your mortgage. Will your mortgage be insured by the CMHC? Not only do you have to pass the lenders to qualify for porting a mortgage there are also CMHC hoops you need to jump through. If your current mortgage is insured by the Canadian Mortgage and Housing Corporation (CMHC) they may allow you port your mortgage. Here’s the catch…part of it. All CMHC-insured mortgage loans covering properties originally insured through emili. Emili is an AVM or (Automated Value Model) and works out the risks based on figures provided to it. The borrowers on the new application must be the same borrowers as on the original approved application. CMHC’s portability feature allows borrowers to port the CMHC Mortgage Loan Insurance from an existing home to a new home and in some cases save money by reducing or eliminating the premium on the financing of the new home. The CMHC portability Fact Sheet is comprehensive with all the information you will need to see how porting will benefit you and what you need to qualify. Maximum purchase price or as-improved property value must be below $1,000,000. All CMHC-insured mortgage loans covering properties originally insured through emili. The borrowers on the new application must be the same borrowers as on the original approved application. 5% down payment for the purchase price (or lending value) portion ≤ $500,000. ■■ 10% down payment for the purchase price (or lending value) portion > $500,000. What are the benefits of porting a CMHC insured mortgage? Reduced Costs — Repeat users of CMHC Mortgage Loan Insurance may be able to save money by reducing or eliminating the mortgage loan insurance premium on the financing of a new home. Do you currently have a variable rate mortgage? If yes then you likely won’t be able to port your mortgage but if you do have portability build into your current mortgage and it’s a fixed mortgage you might be in business. Ideally before you jumped into the process of porting a mortgage you’d want to compare the current fixed mortgage rates to that of what you have. If they are higher than your current rate then filling out a mortgage application to port is probably in your best interest. If you think that porting your mortgage is going to save you money over the term of your mortgage (not the amortization of 25 years), you’ve done the math and you’re eligible to port you may want to consider it. If you’ve done your research about how to port a mortgage and realize that it’s not for you then at least you’ve done your homework. One of the smartest moves you can make as a new homeowner or an experienced homeowner is to research, ask questions and make sure the math is in your favour. No one likes to pay more money then they need to. Saving a buck is nice but saving thousands is like hitting the mortgage jackpot. You’ll basically look at what you can save in interest payments over 2 to 3 years or what ever is left of your current mortgage compared to paying the penalty fees to exit the mortgage contract and pursue a new mortgage rate. If the savings outweigh the penalties, porting a mortgage could be for you. Discussion Questions: Have you successfully ported a mortgage in Canada before? What was the process like for you? Trust me you don’t want to know how my week went. Ok, I’ll tell you in two words, Strep Throat. After looking at photos on-line to show me what I had that sort of grossed me out. I’m still in recovery mode thanks to my wife who suggested I make a doctor’s appointment. It started in my throat and then with-in days I was losing my hearing in my left ear. I’ve spent the last 2 days ripping the insulation out in our basement so I can get it re-insulated and ready to be finished. It makes more sense for us to get this done so our son has more space to run around and play. I hope your week went better than mine! Back to work Monday, vacation is over. I found the flea market flipper website where they detail how much money they made flipping flea market items. In just one month they made over $12,000 flipping flea market and auction finds. When I read that I knew I had to check out what they did to achieve this. There are definitely some great tips here and lots of money to be made if you know how to negotiate and find the deals. If you are a personal finance blogger and would like your blog to be featured simply drop me an email. I’m currently booking August/September 2017-Limited spots. My name is Leo T. Ly. I am a Realtor, an I.T. project manager, an investor, and entrepreneur, a landlord and a Canadian personal finance blogger at ISaved5K.com (a.k.a. a jack of all trades). I enjoy sharing my personal thoughts and experiences on two main personal finance topics. The first topic is how to achieve financial independence by saving your income diligently, managing your money responsibly and growing your savings with discipline. The second topic is how to expand your knowledge in the real estate market to either increase or protect your wealth. I am very open and transparent when it comes to sharing my personal finance as I don’t judge others and I don’t take offense when people want to judge me. My main goal is to share my knowledge and try to help others build wealth through initiatives that I had personally tried and I built a net worth of a million dollars over a ten-year period. I have accumulated my wealth by being a disciplined saver, taking advantage of income tax rules and borrowing money to invest rather than for consumption. I am often excited to take advantage of free money from employers and governments in addition to building more passive income sources. After accumulating my first million dollars, I am now embarking on a second journey towards achieving financial independence. On this journey, I will strive to increase my net worth to two million dollars and retire by the age of 48 – #Freedom48. Feel free to drop by my blog and take a peek at my progress and get inspired to start your own journey if you haven’t started. There are a few reasons why I started a Canadian personal finance blog. The first reason is to create awareness that the Canadian education system lacks the basic financial literacy curriculum to financially prepare the average Canadian for life. Secondly, I want to shatter the perception that talking about money is taboo. 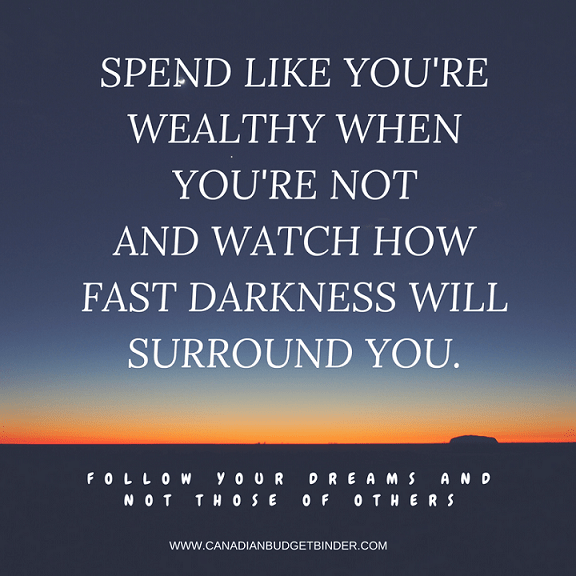 To do that, I will be open, transparent and share as much of my own personal finance successes and failures with my readers as I possibly can. There will be no judgment, resentment nor jealousy of other people’s financial situations. Third, I want to build a Canadian personal finance community were like-minded individuals can come to learn, share and grow their personal finance knowledge. Last, but not least, blogging is therapeutic for me and I am happy to share my tried and tested methods to build wealth with anyone that has the desire to learn. Thank you for featuring me Mr. CBB. I look forward to connecting with this community and hope that I can help make a difference. If you’ve got a brag that you would love to share email me a photo and tell us what you’ve got and costs involved. For every brag whether it gets posted on the blog or not you get an entry into the yearly draw for a gift card. Today Jen Peacock is back at it sharing her garage sale deals for the week. Boy this girl knows how to negotiate! I got in a great day of garage sale deals today that I’m excited to share with all of you. 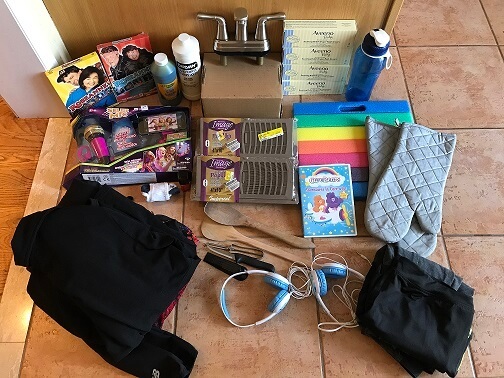 Kids socks, 3 ladies shirts (all brand new with tags), ladies New Balance jacket, ladies shirt – ALL FREE!!! Who doesn’t like the taste of Maple in Canada? These Soft Maple Sugar Cookies over at The Novice Chef are perfect for dipping in milk and I bet it’s hard to eat just one. 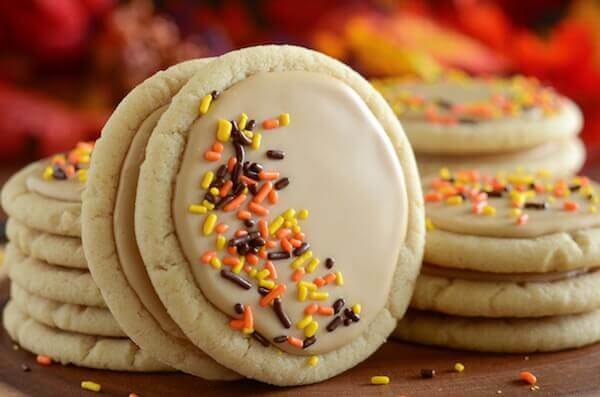 What I like about these cookies was the maple frosting and the addition of sprinkles. I like a hard cookie but every once in a while I like to give my teeth a break. 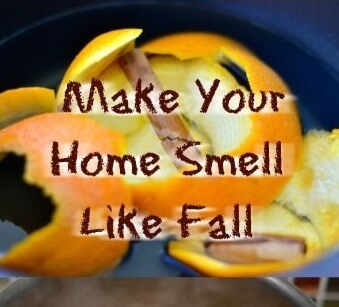 I know it’s not Fall yet however the pumpkin recipes are flowing all over Pinterest so I thought I’d get ahead of the game with this pretty cool way to Make your home smell like fall. The blog Creative And Healthy Fun Food has this simple Fall recipe for Cinnamon and Orange scent that will power through your home. It doesn’t get any easier and you skip the expensive scented candles and save money. How much someone spends monthly on Canada?– I don’t spend anything on Canada but I do spend money in Canada. Can I check the balance of my mothers bank account online?– With her permission or prior consent with the bank or her lawyer possibly. What happens when an ATM gives you more money– When no one is looking you give it a giant kiss. The Saturday Weekend Review #226: Should Managing Debt Come Before House Hunting? I ported my mortgage about five years ago when I sold my first home and moved into my current house. If you are staying with the same lender, the cost is minimal as you only have to pay for administration fees. The catch is you have to close on both houses within two to three months of each other. If it’s more than three months, then you won’t be able to port it. A few years ago, I went to my current mortgage lender and try to ask for the penalty if I broke my mortgage term. They will charge you either the higher of the three months of interests or the interest rate differential penalty. The three months on interest fees was easy to calculate, but the interest rate differential was hard to calculate and the most likely case is that the lender will just provide you with an arbitrary number, but would not provide you with the calculation if you ask for it. The process to obtain that number with the mortgage lender was not fun. If you want to do it, be prepared to visit or communicate with more than one person at the mortgage lender to get it done.